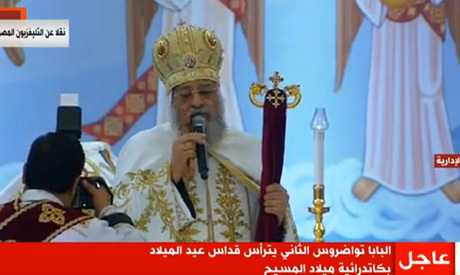 President, along with religious, military and int'l dignitaries, witness ceremony to inaugurate Nativity of Christ Cathedral and Al-Fattah Al-Alim Mosque; Ahram Online provides a live coverage in photos for the historic event. 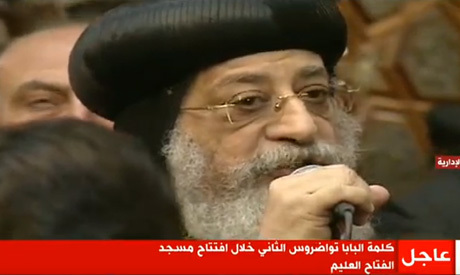 21:40 Following the departure of President Abdel-Fattah El-Sisi from the cathedral, Coptic Orthodox Pope Tawadros II leads mass to usher in a new year. 21:10 After making his way through the crowds who were reaching to shake hands with the president, El-Sisi welcomed Egypt's guests from Arab and foreign countries attending the Christmas celebration at the Nativity of the Christ Cathedral. 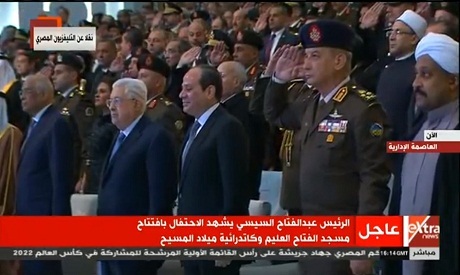 The president then saluted the Egyptians who sacrificed their lives for their country. "I want to say that this moment is very important in our history, because when I was at St Mark's Cathedral a year ago, I told the pope that we would be celebrating the completion of the mosque and the cathedral, and here we are standing together with the promise fulfilled." "This occasion is a message that we will not allow anybody to come between us, and I do not like to use the term sectarian strife because Muslims and Christians in Egypt are one, and will stay one," El-Sisi said. "This occasion represents a tree of love which we have planted together, but this tree still needs attention and care so that its fruit reaches from Egypt to the whole world," El-Sisi said. "Strife will not end, but God saved Egypt and he will continue to do so for the sake of its people," he added. "In 2013, when many churches were attacked, the pope said at the time that "a country without churches is better than churches without a country," I will not forget these words from Pope Tawadros," the president said. "These words preserved our country and enabled us not only to repair what was damaged, but to build new 14 cities and megaprojects," the president said. "On this happy occasion I must stress that Egyptians should take care of their country with awareness and alertness." "Merry Christmas and happy New Year to all Egyptians. Long live Egypt." 20:55 El-Sisi enters the cathedral to a raucous applause and a festive atmosphere from thousands of attendees waving Egyptian flags. 20:45 The head of Al-Azhar – the world's foremost institute of Sunni Islamic learning – Sheikh Ahmed El-Tayeb said that this is a momentous occasion, as it is the first time in history that a mosque and a church are built and inaugurated at the same time. Speaking after the president unveiled the inauguration plaque, El-Tayeb said that "this is the embodiment of the soul of brotherhood and love." El-Tayeb also said that Islamic law dictates that Christian and Jewish houses of worship must be safeguarded to the same extent that mosques are protected. The grand Imam stressed that Egypt's coptic community and their churches have been both build and protected since the arrival of Islam. El-Tayyeb argued against misguided attempts to use fatwas issued in a completely different historical period, such as those defensive edicts issued during the crusades, in our modern world. The grand Imam finished his comments by thanking President El-Sisi and wishing Pope Tawadros II and Egyptian Christians a merry Christmas. 20:30 President El-Sisi arrives at the Nativity of the Christ Cathedral and unveils the inauguration plaque. 20:25 President El-Sisi, accompanied by Coptic Orthodox Pope Tawadros II and other state officials, is set to arrive to the Nativity of the Christ Cathedral in the New Administrative Capital to attend its inauguration. The president will celebrate the Coptic Orthodox Christmas at the largest church in Egypt and the Middle East. Egypt's Christians number 10 to 15 percent of the country's 104 million population. Egyptian Copts celebrate Christmas on 7 January. 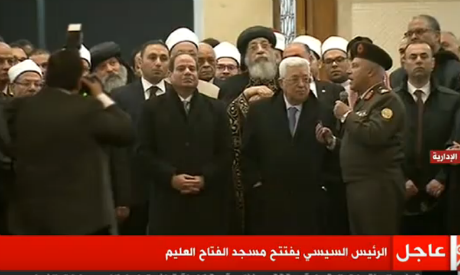 19:50 Following the President's tour and Pope Tawadros II's comments, El-Sisi, Palestinian President Abbas, the head of Al-Azhar Sheikh Ahmed El-Tayyeb, as well as other state officials and Muslim clerics pray Al-Ishaa prayer headed by Imam Osama El-Azhari at Al-Fattah Al-Alim Mosque. 19:40 "This is a day of joy as we see our beloved country write a new page in the history of civilisation," Pope Tawadros II said at the mosque's inauguration. 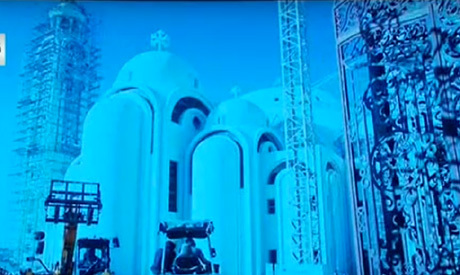 "Today we celebrate an unprecedented occasion where the minarets of Al-Fattah Al-Alim Mosque are embracing those of the Nativity of the Christ Cathedral, opening a new horizon for our beloved country on this happy occasion, achieved through the Egyptian people's donations and efforts with sincerity and love," the pope said. "As an Egyptian citizen, I am happy to stand in the mosque to celebrate its opening with my Muslim brothers." 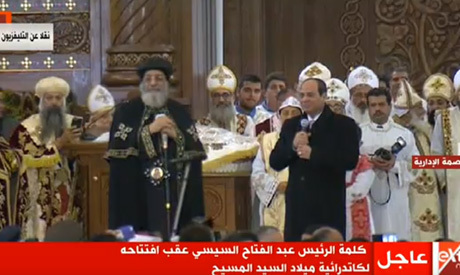 Addressing President El-Sisi, Pope Tawadros II said, "in January of last year, you promised to build the mosque and the cathedral... it was a very hard mission to achieve but we are seeing the promise fulfilled on this great occasion." "We thank you Mr President and all the companies, engineers, and workers who contributed to the completion of these great projects," Pope Tawadros II said. The pope also extended special thanks to the Egyptian Armed Forces and the army's Engineering Authority for completing these projects in such a short timeframe. "We pray for our unity to continue as the world witnesses such tolerance and love in our country, God bless you all, long live Egypt," the pope concluded. 19:30 President El-Sisi inaugurates and tours Al-Fattah Al-Alim Mosque. The president is accompanied by Palestinian President Mahmoud Abbas, Coptic Orthodox Pope Tawadros II, and local and international dignitaries. A senior army officer with the Armed Forces Engineering Authority briefed El-Sisi on the process of constructing the giant mosque. 18:30 President El-Sisi is expected to arrive at Al-Fattah Al-Alim Mosque in the New Administrative Capital after the muezzin calls for the Al-Ishaa prayer. 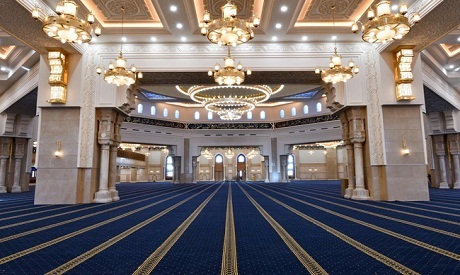 The president will be inaguarating the mosque, the largest in the country and one of the largest in the Middle East. 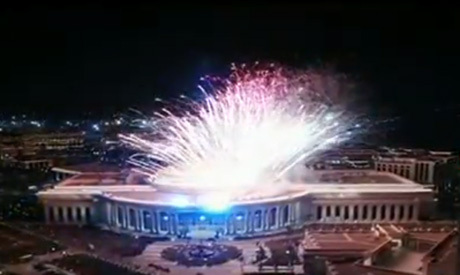 18:20 The opening ceremony for the inauguration of the Nativity of Christ Cathedral and Al-Fattah Al-Alim mosque, which was held at the convention centre, ended with the national anthem, with festive fireworks launched from the top of the new capital’s convention centre. Popular Egyptian singer Angham performed a song about national unity between Christians and Muslims. A group of children participated in a choir about Egyptians being unified, without discrimination. “Muslim and Copt, next to his brother, how will they differentiate them?” the children sung. 17:45 During the ceremony, a short documentary on the construction of both the cathedral and the mosque was played for the audience. 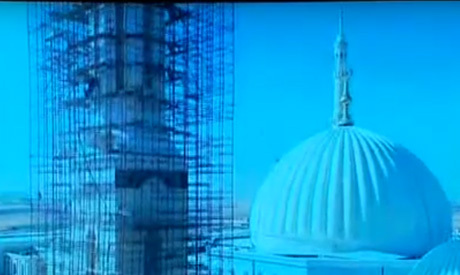 The documentary reviewed the arduous process of constructing both the cathedral and the mosque. The engineering staff that worked on the construction, both men and women, Muslim and Christian, spoke of the solidarity and pride they shared while building the religious landmarks. 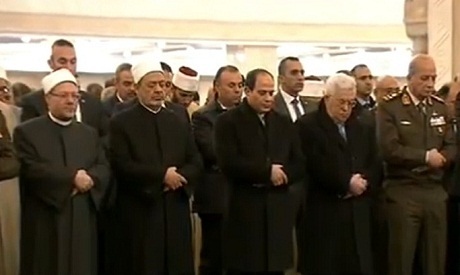 Egypt's President Abdel-Fattah El-Sisi (center), Palestinian President Mahmoud Abbas (left) and Egypt's Minister of Defense Mohamed Zaki (Right) at the ceremony to inaugurate the country's largest Cathedral and Mosque on Sunday, 6 January, 2019. 17:43 US President Donald Trump tweeted, "Excited to see our friends in Egypt opening the biggest Cathedral in the Middle East. President El-Sisi is moving his country to a more inclusive future!" 17:40 In a short video message aired before the attendees, Pope Francis, the head of the Roman Catholic Church, congratulated the Egyptian people, government and president on the inauguration of the new cathedral. 17:30 Following the moment of silence, the celebration on stage started with a live performance of Islamic chants and Christian hymns by various artists. 17:15 El-Sisi asked attendees to stand for a moment of silence for police officer Mostafa Ebeid, who was killed late on Saturday while attempting to defuse an improvised explosive device (IED) found near a church in Nasr City, Cairo. 17:10 The Egyptian president also receives Palestinian President Mahmoud Abbas, who is attending the ceremony along with other Arab leaders. 17:00 Egypt’s President Abdel-Fattah El-Sisi arrived in the New Administrative Capital' convention center to attend a ceremony as he inaugurates the country’s largest cathedral and mosque on Sunday. The Nativity of Christ Cathedral in Egypt's New Administrative Capital, which occupies 30 percent of the 4.14-acre site allocated to the complex. The cathedral can accommodate 8,200 worshippers and the complex has been designed around a large central square. Al-Fattah Al-Alim Mosque, which holds more than 17,000 worshippers, is the largest mosque in the country and the Middle East.